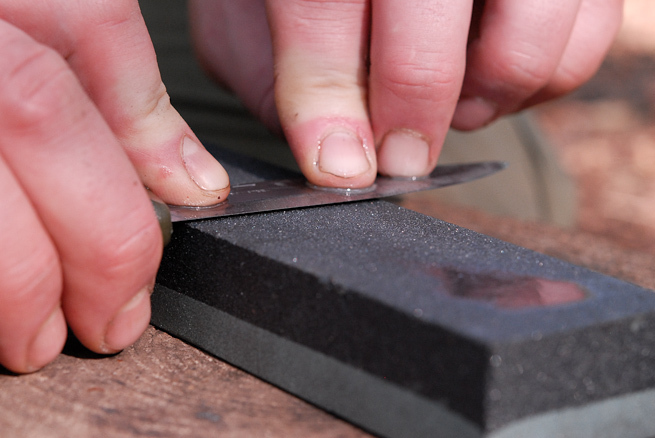 Learn how to sharpen your most important cutting tool. Photo: Ben Gray. There is an old adage that you are only as sharp as your knife. Consistent sharpening doesn’t require expensive or complicated equipment. All you need is a combination oil-stone and an old leather belt. Find a flat surface that won’t be damaged by oil. If you are outdoors, a chopping block is ideal. Place the stone with the coarse side up. Apply plenty of oil. A bevel is the part of the blade that angles down towards the cutting edge. 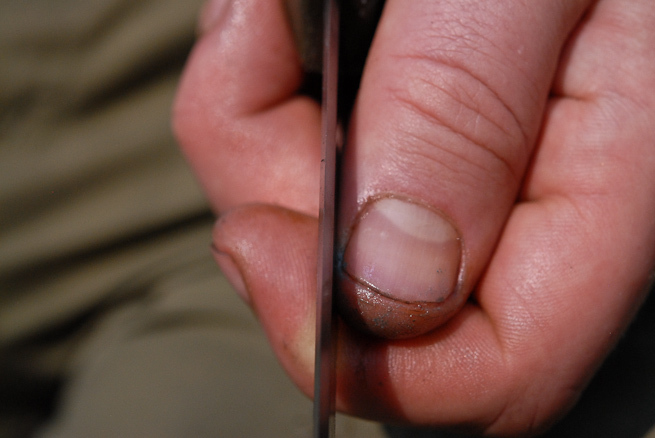 You must remove metal from both bevels of a knife in order to form a fine edge where they meet. 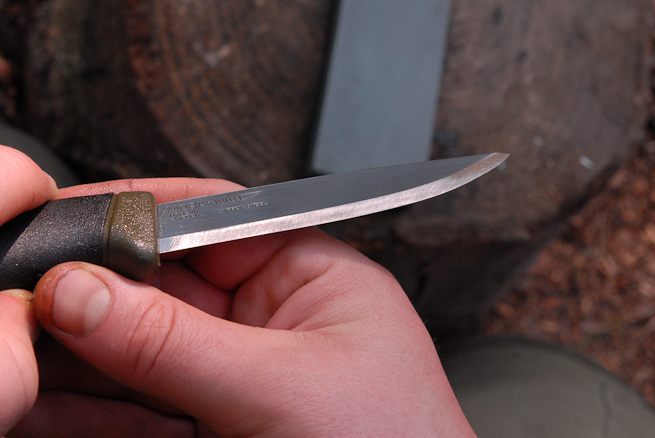 On most bushcraft knives, the bevel is flat. To achieve the correct bevel angle then, place your knife flat on the stone then tilt the knife towards the cutting edge until the bevel is flush with the stone. 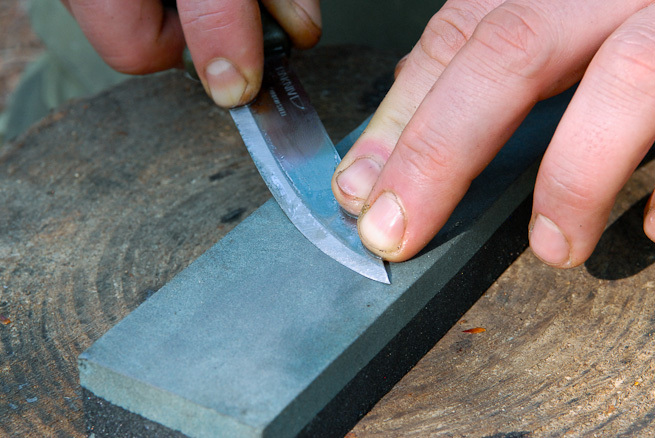 Step 1: Place your knife flat on the sharpening stone. Photo: Ben Gray. 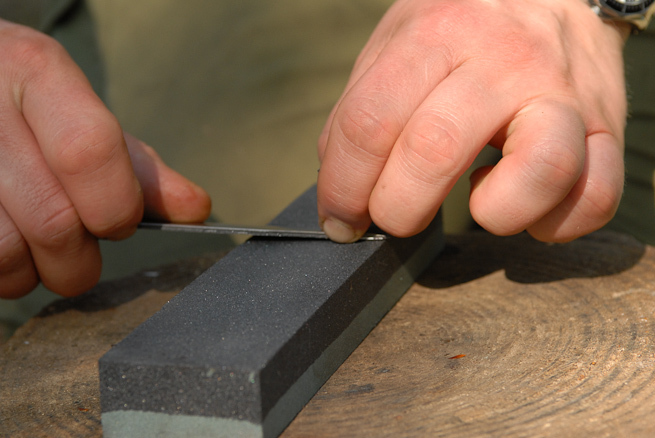 Step 2: Tilt the knife towards the cutting edge until the bevel is flush with stone. Photo: Ben Gray. Start with the knife on the end of the stone nearest to you. With the cutting edge facing away from you, tilt the knife until you achieve the correct bevel angle. Move the knife away from you along the stone, applying pressure with your fingers towards the leading edge of the knife. Apply pressure with your fingers and move the knife away from you along the oil-stone. Photo: Ben Gray. Move the knife across the stone as you move it forwards so that you cover the entire length of the knife. As the blade curves up towards the tip the bevel loses contact with the stone. To compensate, slightly lift the handle towards the end of the sharpening stroke. The curved tip of the knife drops, coming into contact with the sharpening stone. Lift the handle to maintain contact with the stone towards the tip of the knife. Photo: Ben Gray. Continue to move the knife across the stone maintaining full contact with the bevel. Photo: Ben Gray. Where metal has been removed from the bevel it will show as obvious scratches or shiny areas. If your technique is correct, you will see metal has been removed from the whole bevel. If not, adjust the angles as necessary. Metal should have been removed evenly from the entire bevel. Photo: Ben Gray. To sharpen the opposite bevel, turn the cutting edge to face you and place the knife on the end of the sharpening stone furthest away. Draw the knife along the stone towards you. Use your thumbs to apply pressure. Turn the knife so the edge is towards you and run it along the stone from the far end, using your thumbs to apply pressure. Photo: Ben Gray. 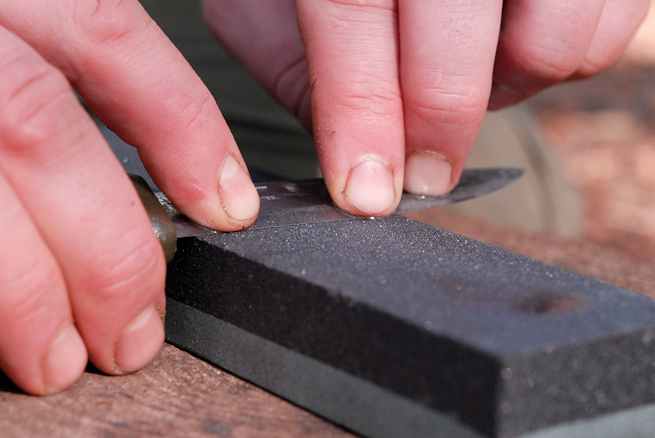 Maintain the bevel angle and an even pressure as you move the knife forward and across the stone. Photo: Ben Gray. Again, lift the handle to maintain the correct bevel angle towards the end of the stroke. Photo: Ben Gray. As you take metal off each bevel, you create a very thin foil of metal where the bevels meet. This is pushed one way then the other as you alternate sharpening strokes. This is sometimes referred to as a burr. If you run your thumb down the bevel you can feel this catch a little on the ridges in your thumbprint. To ensure you are removing metal equally from both bevels you need system to track the number of sharpening strokes on each side of the knife. The method should also take the knife to a progressively finer edge. Repeat steps 5 & 6 ten to twenty times. A smoother finish on the bevel after multiple passes on the finer side of the oil-stone. Photo: Ben Gray. Carefully run your thumb across the edge with no pressure. A sharp edge will catch the ridges of your thumbprint. Carefully run your thumb across the edge to test if it is sharp. Photo: Ben Gray. To check visually, orient yourself towards a light source and angle the knife to see any reflections from flat spots. Look down the edge for any bright spots indicating blunt areas. Photo: Ben Gray. A sharp edge will reflect very little light. Photo: Ben Gray. To smooth the edge and remove any remaining burr, strop your knife. Simply use a leather belt. Attach the belt to a solid upright. Grip your knife in one hand and belt in the other. Run the blade along the unfinished inside of the belt, leading with the back of the knife (i.e. with the sharp edge trailing). Stropping a knife on an old leather belt. Photo: Ben Gray. The angle should be above the angle of the bevel, so that you are slightly scraping the belt with the edge of the knife. 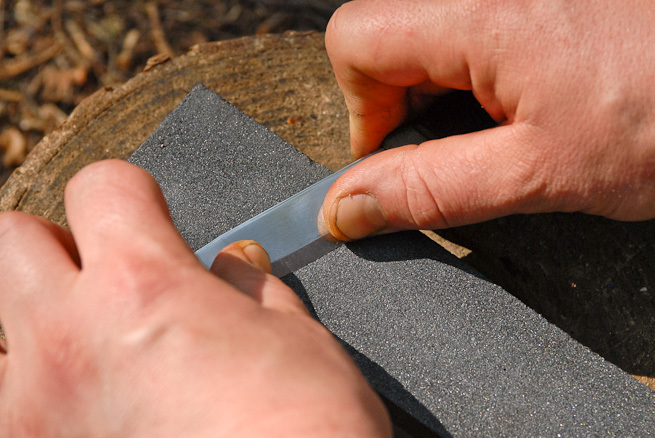 Move the blade across the strop as you move along it so as to cover the whole length of the blade. The away stroke, with sharp edge trailing. Note the angle is raised slightly above the bevel angle. Photo: Ben Gray. Alternate the stropping strokes back and forth. 50-100 strokes is usually enough. The towards stroke, again with sharp edge trailing. Remember to cover the full length of the blade. Photo: Ben Gray. Your knife should now feel razor sharp. 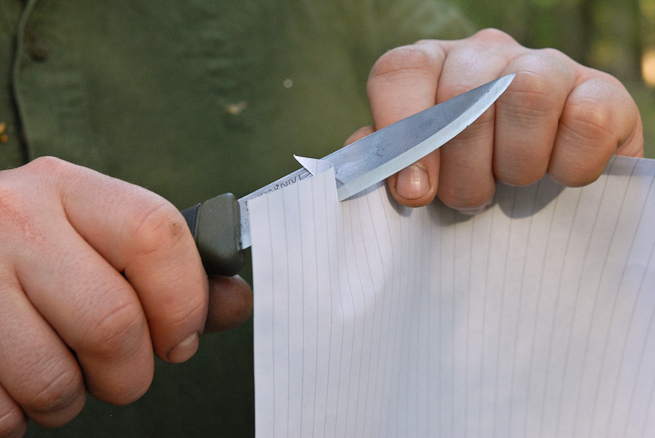 A final test of sharpness is to slice the edge off a sheet of paper. Slicing the corner off a sheet of paper with a razor sharp blade. Photo: Ben Gray. 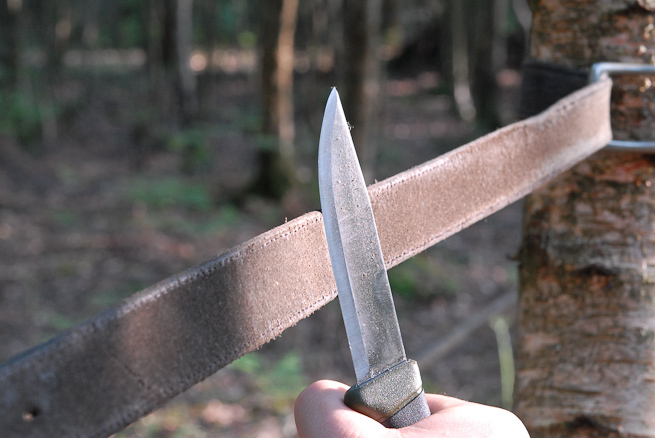 The above method – applied properly – will yield an excellent edge for the tasks we typically ask of a bushcraft knife. The knife in the pictures is not expensive. Nor is the sharpening stone. This combination, however, will provide great results for those willing to master the above. A version of the above tutorial appears in a new, hands-on book of Scouting skills. 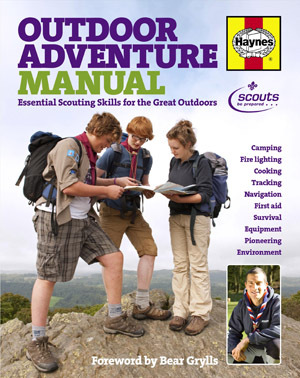 The Outdoor Adventure Manual: Essential Scouting Skills For The Great Outdoors is ideal for any adult or young person wanting to improve their outdoor know-how. Introduced by Bear Grylls, this manual – useful for planning a day’s hike to camping in the back of beyond – has been described as inspirational. This exciting new manual contains sections on survival, wild camping, knots and lashings as well as first aid advice approved by the Red Cross. Featuring over 30 outdoor projects including how to build a tepee and A-Frame shelter, plus step-by-step guides to a range of key backwoods skills such as navigating, camping, fire lighting and cooking, it is backed by hundreds of colour photographs. Get your copy here. Thanks again for taking the time to do the knife articles for the book, good clear pictures and text as usual! You (and The Scout Association) are very welcome. It was an honour to be able to give something back to Scouting. I hope it allows many Scouts to keep their knives keen. This is virtually identical to the procedure and sharpening tool I use for all my camping/bushcraft blades and even our kitchen knives. It’s very effective. Thanks for taking the time to post such clear photos of the process. Thanks for your comment and I appreciate your feedback on the images. It is indeed very effective and it’s good to know you find it so too. I like this a lot! A very useful and clear guide on how to do things properly – clearly written and excellent photos too. Well done. I’m pleased you like the article. Great explanation once again thank you. I’ve already linked to it from our site. 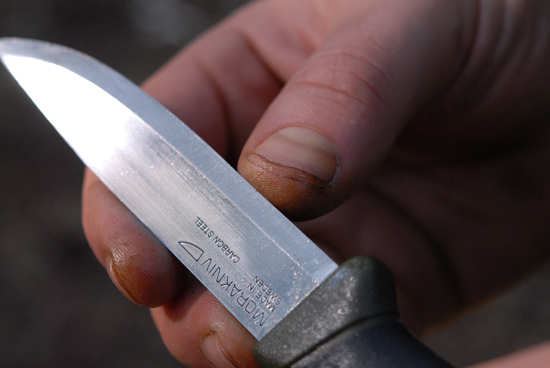 Great article on knife sharpening. I really enjoy sharpening, its very therapeutic. Great clear instructions and images. 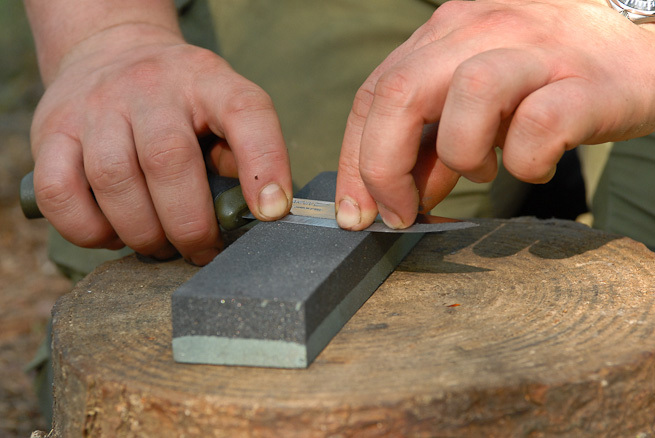 I also find sharpening therapeutic – particularly on a bench stone. Paul, many thanks for the article. 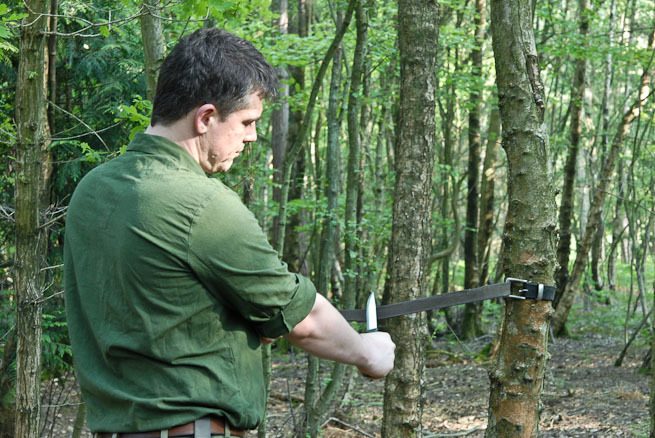 It’s so nice to see someone with as much experience and expertise as yourself using basic equipment, I think the norm for people first getting into woodland skills is to have own expensive blocks and other must have kit. I must say sharpening is a meditative act for me and am always looking out for new tricks. I’ve recently been carrying some very fine wet and dry sandpaper, so far it seems to work well. Looking forward to reading more. 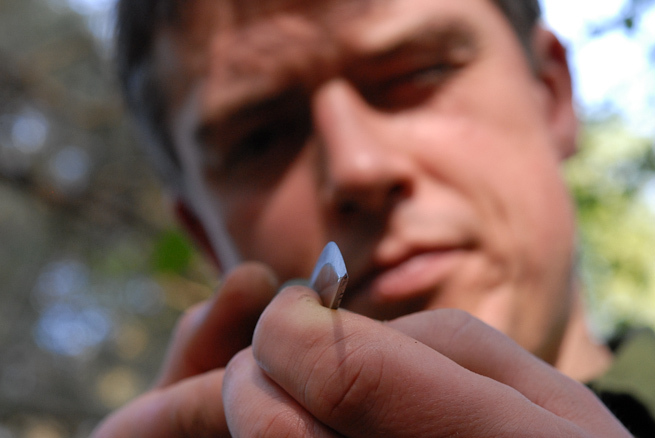 Makes a very very sharp edge indeed and is lighter than a grind stone to carry. Thanks for the great article. I was wondering about stropping compounds, I use a compound when stropping my detail carving knives and spoon knives, I strop them frequently when using them and find I rarely need to do much more to them. 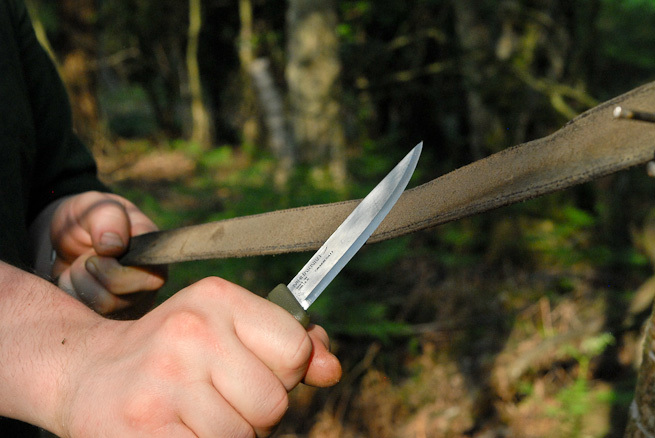 Do you think using a compound when stropping my main bushcraft knife would be beneficial or not? Thanks for your comment. I’m glad you enjoyed the article. Stropping compounds can help produce a very fine finish. They may well be worth applying to your best knife to bring it to showroom conditions but are by no means necessary to attain a keen edge. I always try to show people the most straightforward and appropriate method of achieving a result. Here – sharpening the ubiquitous Mora – I personally don’t think it’s necessary to use expensive waterstones, dedicated strops or stropping paste. But if you have invested in a hand-made knife, then I would recommend that you do invest in a more elaborate sharpening and honing outfit which will be able to produce a more refined result. I just wanted to ask a follow up about sharpening stones. I understand the need to keep a knife sharp and there is a LOT of information about this, but my question is this: what is a good cheep introduction sharpening stone? And where is the best place to get them. I’ve been looking around and found lots of sharpening systems and stones for varying amounts of money. All I am looking for is a good quality stone to use on a mora clipper to keep sharp (and safe) but do not want to spend a fortune. I just can’t find information for this and don’t want to jump the gun and send £75+ on a Japanese water stone. The stone being used in the pictures is a combination aluminium oxide oilstone. I would guess one side course/medium and one side medium/fine. They seem to run around £20 – £30 plus a few quid for a tin of 3-in-1 oil or similar. Thanks for that Paul, I do have a good set of stones and strops, I like to take care of my tools. A birch bracket fungus cut in half and with clay on the cut surface can be used for honing a knife. This setup can be made outdoors with just a knife. The fungus can be used several times. The clay dries up after use. Start again by putting a little water on the clay. Take only clay that has no sand in it. If you rub the clay between the fingers and it feeld gritty discard it. Yes, here it’s also known as razor-stop fungus. Hi Paul, I recently read this to re-cap on what you’ve shown me. I have one issue when I try sharpening, thing is I can’t work out why… I have had much practice with my Mora and have become very good and can take tiny slithers off a sheet of paper when testing it, so I thought I’d brave it and give my enzo a go, but no matter what I can’t get it as sharp as the mora. It does the job indeed but I don’t get the same razor sharpness. Any idea’s? (Difficult I know without seeing the blade) I am using jap waterstones. Is the steel of your “posh Damascus” knife harder or softer than the Mora? On my oilstones, I use 3-in-1. Thanks for the article Paul. How do you keep a carbon steel knife so shiny? My knife lost that shininess after about a week. Hi Paul, another good article. Being a bit lazy I use these gadgets that do seem to work and are not heavy or bulky for when I’m out and about. Are these really any good? Nice article. Explains a lot of what is needed. But the oil. Is that special oil or can you use olive oil or engine oil to sharpen the edge? Any thinner oil will work, but you’d do well to avoid an oil that will go rancid. 3 in 1 oil is very common, you can buy fancy honing oil. Or WD40. Or kerosene, though I don’t recommend that. It doesn’t really matter, you just want something that will keep the pores of the stone from clogging up. Personally I only use water, unless the stone was oil impregnated from the factory, or oil has been used on it in the past. Nice explanation, but maybe it wouldn’t be a bad idea to recommend not going to the stone every time. 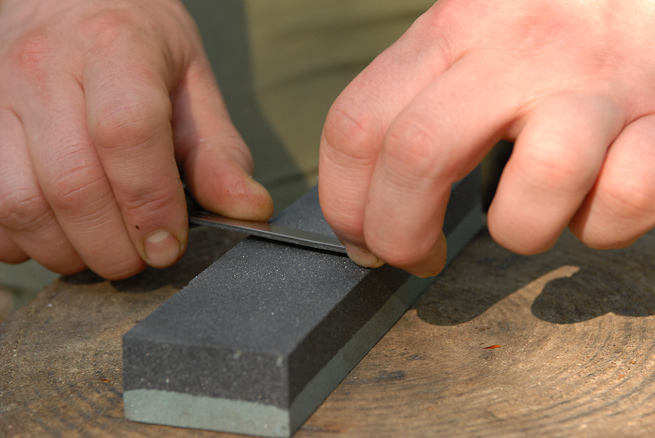 A strop with stropping compound can be used to maintain an edge for a very long time. A stone is only really necessary if the edge suffers damage. Some people maintain their edges with fine ceramic stones/rods instead of strops and, again, only going to a stone when the edge has been damaged. Starting with a coarse stone every time you sharpen your knife will only shorten its life. Shouldn’t the paper cut be to test if the bevel is the same on both sides of the knife? I keep seeing movies cut the paper after sharpening (and it always slashes in a curve), but any sharp knife can cut paper. I suspect that they historically do the paper cut thing was to see if the bevel was sharpened to the same angle on both sides of the knife. So, if this is the case, what do i do when the knife curves to one side? As far as I’m concerned I do the paper test as a test of sharpness. As you say any sharp knife can cut paper. True. But the logical corollary is that any knife that doesn’t cut paper is not sharp. A flat bevelled knife will only develop unequal bevels over time, as a result of consistently unequal metal removal from the respective bevels. 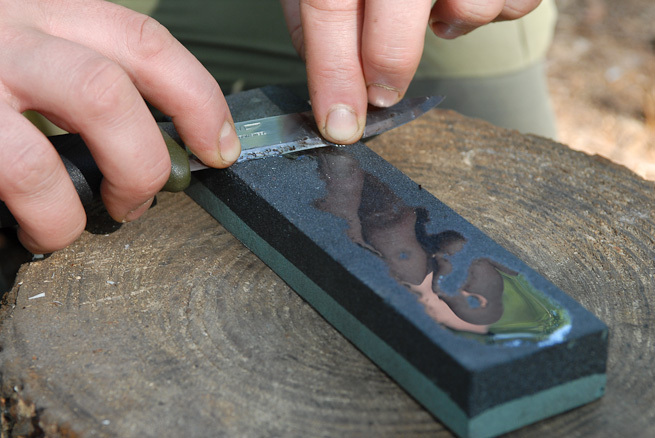 To get more of a mirror finish on your knife bevel, you should use a fine waterstone 6,000 or 8,000 grit say. 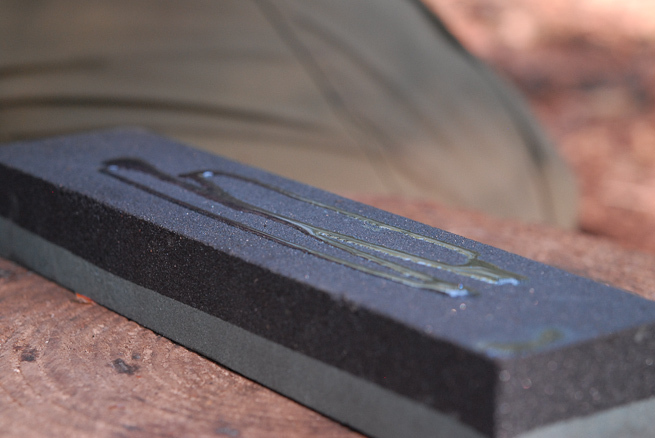 You can also use a leather strop with a little metal polishing paste, something such as Peek or Autosol. Thanks for posting this article. I found it very helpful. My mora was blunt from lots of carving, I mainly use it to make catapults from tree forks. I only work with hardwood so this obviously takes its toll. Using the instructions in this guide I took the edge from not being able to cut paper to being able to shave the hair on my arm. I just went slow and made sure that I stayed with the grind on the knife. The strop at the end is what really makes the difference. Hi Mr. Kirtley. I was curious if you have any suggestions on a good quality, but low cost sharpening stone. I have the mora companion heavy duty knife and i love it so far. The edge is still razor sharp, but with how much I plan to use it, it won’t stay like that for long on its own. I love the instructional posts! I noticed that, in the article, you are using an oil stone. Am I correct in believing that if you put oil on a whetstone you will not be able to use for wet sharpening again? For anyone struggling to maintain the correct bevel (getting blunt spots). Cover the bevel in permanent marker first, after a few strokes the bits that still have marker on haven’t been in contact with the stone. Hi Andrew, yes this is a good tip and one that works very well. Also, the following video is helpful and can be combined with the permanent marker tip. Hello Paul, I have just signed up to your site, and this is the first article you have sent me. I am amazed at your generosity for providing all these Very Well Done Articles, free. It was the Knot tying videos that got my attention first. Even though I have been Camping for the last 50 years, now, after your free videos, I will be able to go camping and Show off my new learned Skills. For that, I Thank You Very Much. Thanks for the article, Paul. I was playing with making a featherstick tonight out of a scrap 2×4 (I’m in the city right now and it’s winter in Canada. Use what you have, right?) and had awful luck getting any sort of nice curls to show up. Since your featherstick articles link here, I took a little while and ‘fixed’ my Mora knife to return it to the factory grind using your method, and tried the featherstick again. Amazing difference! I understand now the purpose of the fine edge bevel on most bushcraft style knives. The curls came much more readily with the scandi grind. Though admittedly still not great, which I imagine is a combination of using crappy construction lumber to practice on, and needing more practice. Thanks for continually bestowing your expertise on the internet! At Last! Someone advocating cheap knives and cheap oils stones – something I’ve been doing for years! I get sick to death of this knife fetish most bushcrafters seem to have. 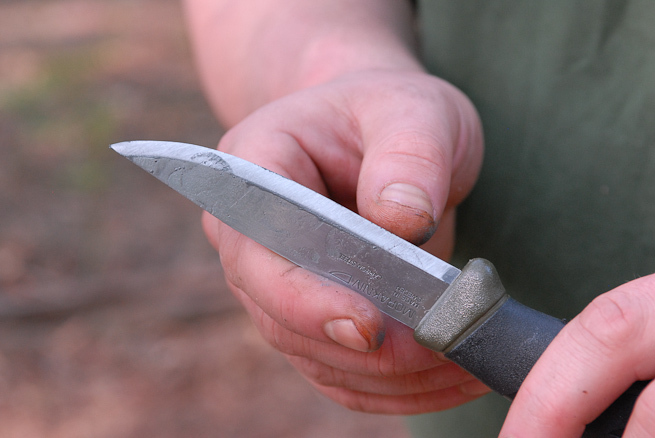 Get yourself a More Kansbol – it’s all the knife you’ll ever need for tinkering in the woods. I love your guides and videos. My friends and I are going to begin hiking and camping this spring and summer, and I am expecting to put heavy wear on my knife which drew me to your guide. There are a lot of whetstones out there and I am not certain where to start. I see Japanese whetstones that aren’t prohibitively expensive ($30-40 USD) but are those really worth the money? Per your advice I directed my group toward Moras, so it strikes me as strange to invest more into a whetstone than I do my knife. What is a good whetstone to start with having never sharpened a blade before in my time? Hi Darron, thanks for your comments regarding my blog articles and videos. I’m glad you are finding them useful. With respect to Japanese waterstones, if you can get a 1000/6000 grit combination stone, it will provide good value. It will ensure an excellent edge on any knife you sharpen with it, starting with your Mora but also any other knives you might own in the future. Hi Paul, I have long known about using the thumb to check for sharpness of a knife, but recently came across a suggestion to use the thumb*nail* instead. Start with the blade perpendicular and then increase the angle until you see what angle the blade starts to slip. The sharper the more parallel it can stick. Yes the nail trick works well. Like anything, it takes practice. And everyone has a couple crappy knives lying around to practice on before they take a swing at sharpening their good one(s). Was thinking about this last night and wondered why the final strop drags the sharp edge backwards, but on sharpening on the stone you’re pushing the mental from the edge back up the knife rather than pulling the knife towards you. 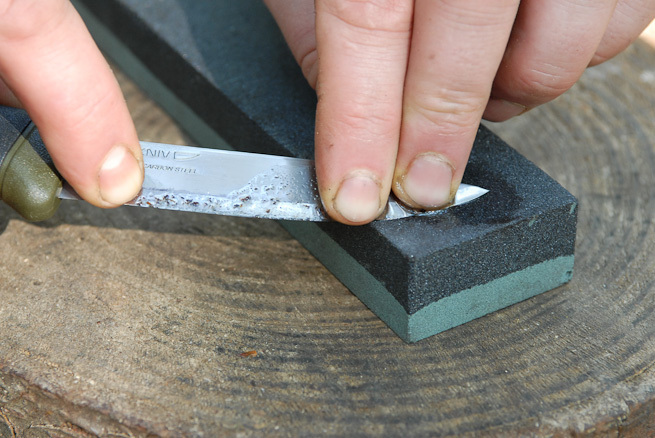 Why isn’t it done the same way on the stone as it is on the strop?